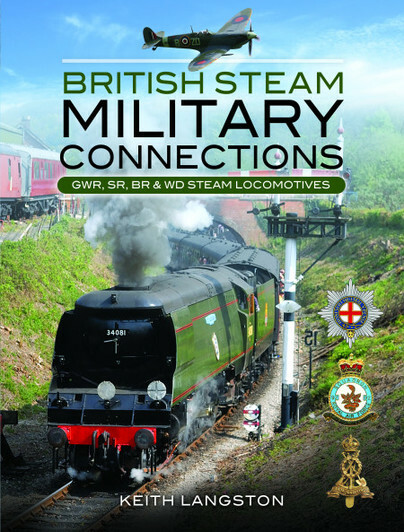 You'll be £25.00 closer to your next £10.00 credit when you purchase British Steam Military Connections. What's this? In Great Britain there existed a practice of naming steam locomotives. The names chosen covered many and varied subjects, however a large number of those represented direct links with military personnel, regiments, squadrons, naval vessels, aircraft, battles and associated historic events. For example, all but one member of the famous ‘Royal Scot’ class were named in honour of British regiments. Also the Southern Railway created a ‘Battle of Britain’ class of locomotives, which were named in recognition of Battle of Britain squadrons, airfields, aircraft and personnel. In addition, the Great Western Railway re-named some of its engines after Second World War aircraft. The tradition has continued into modern times as the newly built ‘A1’ class locomotive is named ‘Tornado’ in recognition of the jet fighter aircraft of the same name. This generously illustrated publication highlights the relevant steam locomotives and additionally examines the origin of the military names. The author presents a first class selection of monochrome and colour images, supported by clear descriptive text in explanation and linking of the images. The transport images will be greatly appreciated by rail enthusiasts, but there are also images and excellent text depicting the subjects for which the locomotives were named. This is a delightful, evocative book that is affordable and of first rate quality in its production. Should become a transport best seller. This is a well-researched book that can be picked up again and again.